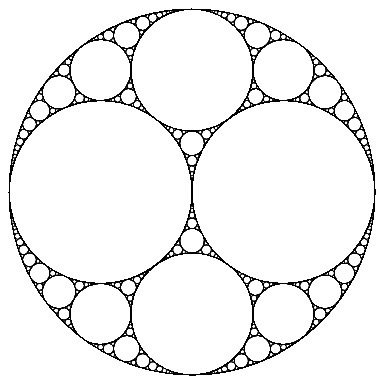 I’ve recently discovered the beauty, symmetry and mathematical richness of Apollonian gaskets. Here’s a very short code (under 128 character’s length) that I’ve made with Wolfram Mathematica guided by the saying “Beautiful math can often also be very simple“. And here’s the twit published by @wolframtap (Wolfram Tweet-a-Program). Well, actually that is not a complete Apollonian gasket, but it can give the idea. To produce a full gasket the code should be longer than that allowed by a twitter length, but I think that a basic one could be done in about 500 characters or less. This entry was posted in Beautiful math, Math and tagged apollonian gasket, wolfram mathematica on 07/04/2015 by Luca M.